Sony MDR-Z1R review | What Hi-Fi? Sony turns 70 this year, and celebrates that landmark with a range of Signature products. The range consists of two portable music players, a desktop DAC and the MDR-Z1R headphones on test here. All the products carry premium four-figure price tags and are meant to showcase the company’s expertise. In the case of the MDR-Z1R, £1700 buys a pair of large, understated closed-back headphones. As is Sony’s way, there’s little exuberance in the design. If you’re expecting overtly luxurious touches or extravagant styling for your money, these aren’t the cans for you. What do you get is obsessive attention to detail. The MDR-Z1Rs use a relatively large and rather unusual dynamic driver. This unit has a two-piece 70mm diaphragm made up of a magnesium dome sitting in the middle of an aluminium-coated liquid crystal polymer ring – try saying that after a few beers. The result is an impressive claimed frequency response that extends to 120kHz. The size of the driver was chosen to give the headphone’s sound the dispersion Sony’s engineers wanted, as well as give the presentation the kind of authority only a larger driver can bring. Its motor system uses a powerful, high grade Neodymium magnet, which has plenty of output and gives these cans a useful sensitivity of 100dB/mW. It’s all connected by specially developed lead-free solder that is designed to give the purest signal transfer. This is the kind of small detail that shows just how far the engineers have gone to maximise performance. We don’t often write about grilles, as there’s not usually much to say. In this case, however, we’ll make an exception as those in front of the drive unit on the MDR-Z1R almost qualify as art. The engineers looked at the way traditional grille designs affect the sound and decided to try something different. After plenty of research they ended up with a pattern based on the Fibonacci sequence. They found this approach caused the least high frequency disruption, and have graphs to prove it. While these are closed-back headphones there’s a twist here too. Sony has used traditional Japanese paper techniques to make a backing of Canadian softwood and just the right kind of water (yes, you read correctly) to come up with an absorbent, low resonance enclosure. The outside of the enclosure is protected by a contoured stainless steel wire gauze that’s coated with a chromium compound, said to be highly resistant to scratches or marking. We’ve used our review sample heavily for a number of months and it still looks as good as new. Comfort is vital in a pair of headphones and Sony hasn’t taken any shortcuts here. A word of warning, though – these are big headphones, and while there’s plenty of adjustment they may still feel a touch loose on the smallest of heads. They’re not unduly heavy at 385g, and the wide, nicely padded beta titanium headband – a material often used in spectacle frames and used here for its low weight and flexibility – sits comfortably. Both the headband and nicely cushioned earpads are covered with soft, high quality leather, which feels good to the touch. The earpads have been shaped with care too, making these one of the most comfortable full-size headphones we’ve used. Though, as with almost every closed-back design we’ve tried, our ears do warm up over extended listening sessions. There’s a choice of connecting cables – a standard 3.5mm version (plus a 6.3mm adaptor) and a new balanced option using a 4.4mm jack. This connection is also found on Sony’s TA-ZH1ES desktop DAC. The leads are 3m long and easy to swap thanks to a small screw-type connector on each earcup. While these Sonys will work off a phone it pays to use better quality sources. We used a range of partnering kit during this test. The main sources are our Naim NDS/555PS streamer, Clearaudio’s Innovation Wood turntable as well as a MacBook Air (loaded with Pure Music software and plenty of hi-res music). Chord’s excellent Hugo carried out amplification duties, but we drafted in Sony’s partnering TA-ZH1ES desktop DAC to test the MDR-Z1R in balanced mode. If you have the option then balanced is the way to go. The first thing we notice is the Sony’s seismic bass performance. It’s not massively overstated as is the current fashion, but impresses through a combination of power, authority and agility that few rivals match. Being a closed-back design helps as far as bass quantity and power is concerned, and of course, drops the amount of environmental noise to a low level. It means you can listen to music with someone else in the room, and neither of you get disturbed. We tried a range of music from Han’s Zimmer’s Interstellar OST right the way through to E.N.D from Black Eyed Peas and these cans take it all in stride. Interstellar shows off the Sony’s scale and dynamic reach, and we’re impressed by the headphones’ composure during the demanding peaks of Mountains. We like the controlled and composed way they organise the instrumental strands when things get complicated. There’s no sign of stress or a hint of hardening up, even at higher volume levels. Tonally, things are nicely balanced between the powerful low-end and crisp treble. While open-back designs such as those from BeyerDynamic and Grado will invariably sound more open, by closed-back standards these Sonys are impressively spacious sounding and pleasingly articulate with it. They also shine when it comes to detail resolution. If you want to hear every last nuance in your recordings these Sonys deserve to be high up on your list. They dig up a terrific amount of detail and present it in a coherent and musical manner. Listening to the Black Eyed Peas’ Boom Boom Pow shows that these headphones know how to have fun. They deliver the track’s pounding, richly textured bassline with enthusiasm, capturing the hard-hitting rhythmic flow with ease. While an initial listen may highlight the Sony’s controlled delivery, a longer listen reveals there’s little missing in the way of drive or entertainment. The midrange is as impressive as the frequency extremes, with the headphones delivering the group’s distinctive vocals with fluidity, conviction and when required, subtlety. The MDR-Z1R’s excellent insight means vocal and instrumental tracks are easy to follow, even in a dense mix. 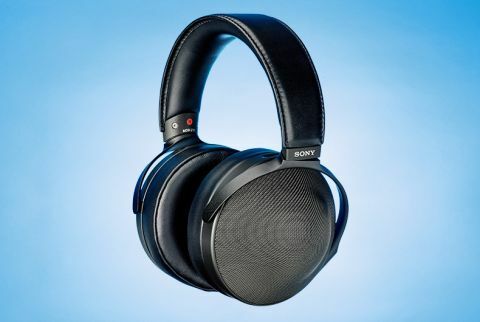 Sony hasn’t been shy about charging a premium price for these headphones. Thankfully, the MDR-Z1R is capable of a performance that justifies such an expense. If you want a closed-back headphone, and are willing to feed these Sonys with capable electronics, we don’t think we’ve tested a better alternative.